Transparency used to mean ‘see through’. More recently, it’s been vogue to talk about transparency in terms of information and context. Why? Things have gotten more complicated and simple at the same time. Let’s take the progress of communication technology as an example. The communication tools I used as a small child (two cans with string between and shouting), progressed to a telephone and transistor radio (both of which I was able to disassemble into tiny pieces), and now consists of the internet and my iPhone (things that are rather mysterious to me and hard to take apart and understand). But the Internet and my iPhone are actually more simple to use than any of the others above. 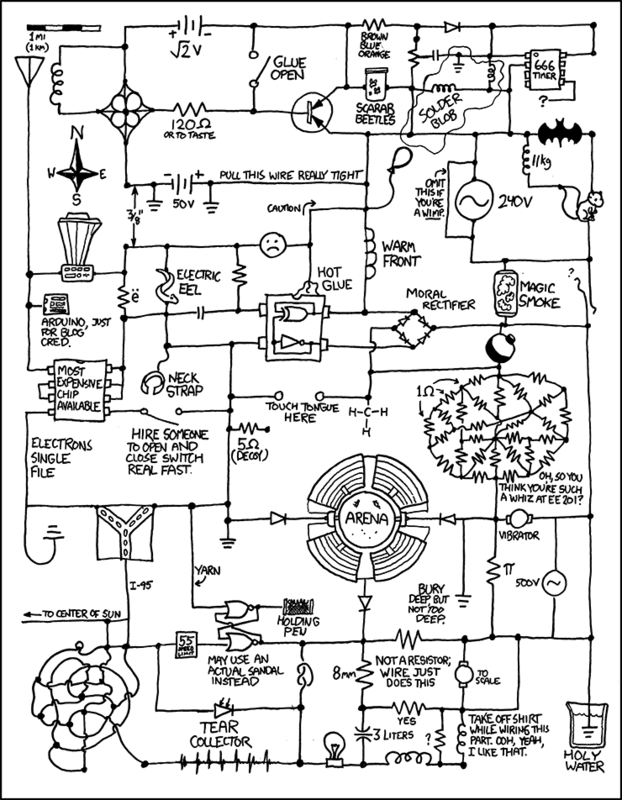 This circuit board diagram from XKCD could be absolutely correct for all I know about designing hardware. So anyway, what’s the point and why I am I talking about this? Middle managers are increasingly dealing with complex issues. A process diagram of how an important decision is made and executed at the middle manager level, utilizing all the stakeholders (collaborators, bosses, customers, peers, and employees) is likely as nutty as the diagram above. The ‘connectors’ between decision points is communication: communicate about what the goals are, what roles and responsibilities each stakeholder has, timelines, where there could be resistance, status updates. Whether you do it in written form, with two tin cans and a string, texting, Tweeting, Facebook, blogging, or hallway conversations, getting the job done involves connecting the dots. Thoughtful transparency helps everyone do their job better. This entry was posted in Coaching, Humor, Leadership, Learning and tagged circuit board, communication, communication technology, complex, iphone, leadership, middle manager, process, transparency, XKCD. Bookmark the permalink.